It's been a busy week since my return from camping! No sooner had I packed away my sleeping bag and I was off with the other 31 of you to the lovely Belton Woods. We were blessed with 2 dry days, 2 wonderful courses, and I think all agreed that the facilities and service were excellent. 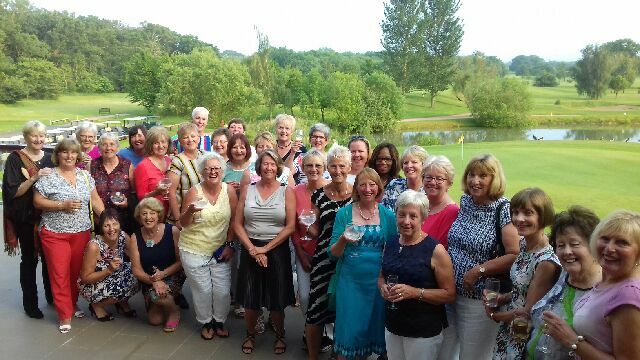 We learnt a lot about each other over a few glasses of wine, thanks to Nikki B and managed to collectively lose 106 balls, yes 106 balls over the 18 hole Lakes Course on Tuesday!! Thanks to Katy and Lin for organising a fantastic weekend. Please consider doing the task next year....there are lots of great venues to choose from and deals to be had. Katy or Lin will be happy to give you any advice....! Charity Day is on Thursday this week. A huge thanks to all who have already donated and all the help in organising the event. There are now 5 vouchers for fourballs at local clubs up for auction on the board in the changing room so get together with your pals and get a bid on the sheet! Registration and raffles on Thursday will be ready from 8.30 and tea and coffee will be available in the bar. We are hoping that the Air Ambulance will land on the range at around 1.30pm that day (operational issues depending) so keep your eyes peeled. We played our midweek monthly medal on Thursday - congratulations to Vicky and Anne, the winners in each division and another new member, Karen Morton won the Ladies weekend stableford. Well done! The handicaps are falling though probably not as much as hoped....! 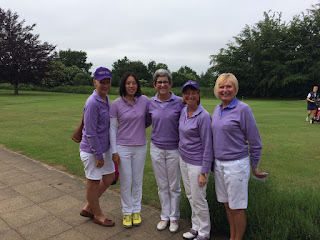 The Scratch team had a match v Verulam very early on Sunday. As the sun came out there was some great golf played, the course was in fab condition and it is always good to renew friendships! At the end of it 3 matches didn't finish until the 18th hole and we gained a very respectable draw overall away from home. Well done all. Verulam have a Ladies Open on Thursday 5th July and a Ladies Open Invitation Day on Saturday 18th August. This could be a chance for our weekend ladies to enter an Open. Details and entry forms will be on the board at the rear of the changing room in the week. Pauline Harrison will be visiting us soon from NZ and staying at Kathy Carroll's house. Kathy C is willing to host a Bring a dish/Pot Luck supper at her house on Wednesday 20th June 7pm onwards. Kathy will provide wine and soft drinks. Please let Kathy know by Sunday 17th June if you are coming and which dish you are bringing. If there are too many of one course you may be asked to change. First replies get priority! Should be a great night and will be good to catch up with Pauline. Looking forward to seeing lots of you on Thursday and offering a warm welcome to all our guests. Don't forget if you can't play please come and buy some raffle tickets, have a coffee and maybe spot the Air Ambulance!